In Granite City, Ill., 500 laid-off steelworkers are being called back to work, a result of President Trump's steep tariffs that go into effect Friday on imported steel. 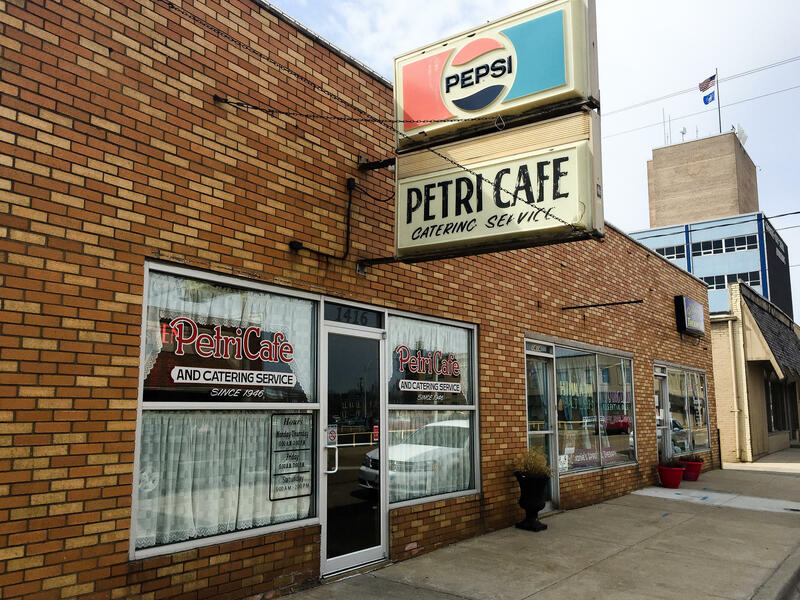 Just down the street from the steel mill in Granite City, Ill., stands Petri Cafe. Owner Larry Petri says for the past 71 years the ebb and flow of the mill has always affected the cafe's business. Brenda Whitaker spent many years working in the steel mill in Granite City, Ill., before deciding to go out on her own. She now owns a used-book store that also sells used records, vintage posters, assorted knickknacks and more. The vinyl flooring is made up of scratched and damaged records. That even goes back to the city's founding in 1896, because the enormous steel mill that Granite City is known for wasn't built in the town. It was actually the other way around. "Our community here, Granite City, was originally designed as a planned community, much like Pullman in Chicago is kind of famous for being," says James Amos, Granite City's economic development director. "This community continued to be built around specifically the steel mill." For more than a century, this city across the Mississippi from St. Louis has been known as a "steel town." No one knows that better than Delmar Farless, who is more than a century old. "I'm almost six months past! My birthday was in September," says the 100 1/2-year-old Farless. "And I've lived here since 1924." As he eats lunch with some younger friends at Petri Cafe, Farless recalls that like many in this town of 29,000, he worked in the town's signature mill. "When I got first married," he says, "I worked two years at Granite City Steel," which is what it was called then, decades before U.S. Steel would buy it. And Farless says it is what put Granite City on the map. "If it wasn't for Granite City Steel, people wouldn't have came here," he says. "That was the main place, boy, when I was a kid." At its peak in the 1970s, the mill was a massive operation, employing more than 4,500 people. There were still about 2,000 people working there in December 2015, when U.S. Steel shut down the mill's two blast furnaces and ceased production, laying off all but a couple of hundred workers. The ripple effect of losing those good-paying jobs hit the community hard. It also hurt suppliers and machine shops that work with the mill, as well as those who work in logistics — running the trucks, trains and barges that bring raw materials to and from the steel mill. "Today, we've got a situation where we've got another 40-plus companies in the heavy metals industrial cluster in the area," says Amos, the economic development director. "And so all of these businesses are integrated together; they work together in kind of a symbiotic way." 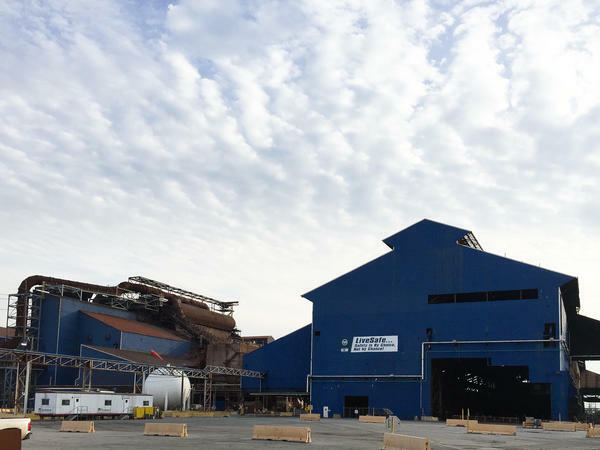 "U.S. Steel's production facility is by far the largest of them," says Amos, acknowledging that the mill's impact on Granite City's economy is huge. But "Granite City does not live and die on one steel mill," he is quick to add. "We're a bigger town than that and there are other thriving jobs in our community." He points to the city's medical center, the Prairie Farms dairy, a Kraft Foods processing plant, trucking companies, the rail yards and America's Central Port at the intersection of two of the nation's busiest waterways, the Mississippi and Missouri rivers. Still, Larry Petri says he sure feels it when there are layoffs at the mill. He runs Petri Cafe, which his parents started 71 years ago just down the street from the gigantic steel mill. He says the ebb and flow there has always affected the cafe's fortunes. Petri has weathered many steel industry downturns over the years but now says that U.S. Steel is not the only game in town. "We have another mill, American Steel, down there; we have the hospital; we have other smaller businesses that have seen the effect of the mill being shut down but they've survived," Petri says. Among those survivors is Laura Smith, who with her husband owns Holt's Shoe Shop. It specializes in metatarsal industrial work boots. "It has a steel toe and this plate that goes on top of it," she explains, "so if they drop something on it, it doesn't break their foot." These metatarsal boots are required for anyone working inside the steel mill and are a big part of the Smiths' business. "When they shut down, we went down about 28 percent," she says. But Holt's Shoes has survived by catering to customers who work in those other, albeit overshadowed industries, including the area's rail yards, the port, the food and beverage processing plants, and other factories. The longtime family-owned shop, which the Smiths bought from the Holts a couple of years ago, also does shoe repairs, a personal touch that helps it stave off competition from big retailers like Walmart. 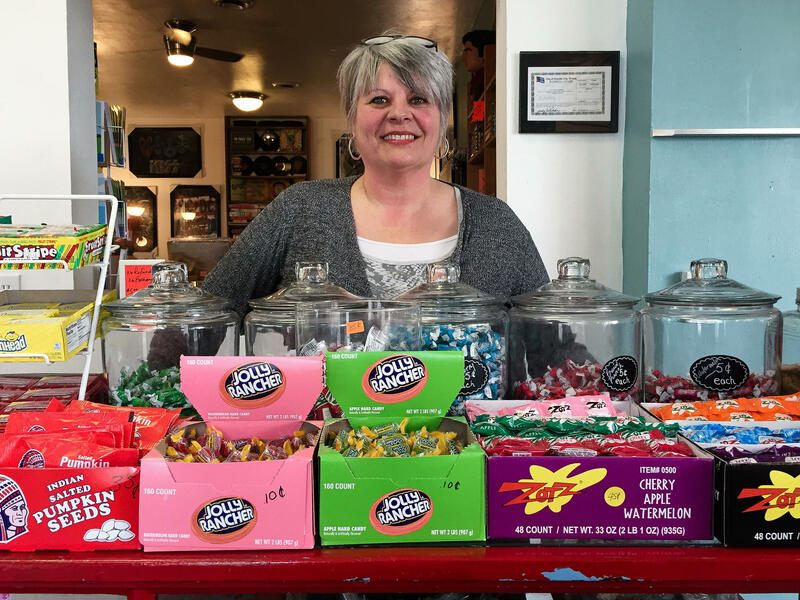 Granite City's long-term economic development plan emphasizes the kind of entrepreneurship demonstrated by the Smiths and people like Brenda Whitaker, who spent many years working in the mill herself. "I was a coiler operator on the 80-inch hot strip and I worked there for 15 years," she says, before deciding to go out on her own. Whitaker's first venture was a quaint restaurant called the Garden Gate Tea Room, which NPR first featured seven years ago in a story on efforts to diversify the economy in Granite City after the great recession. She still owns and runs that restaurant and is now opening a new one, a 24-hour diner. 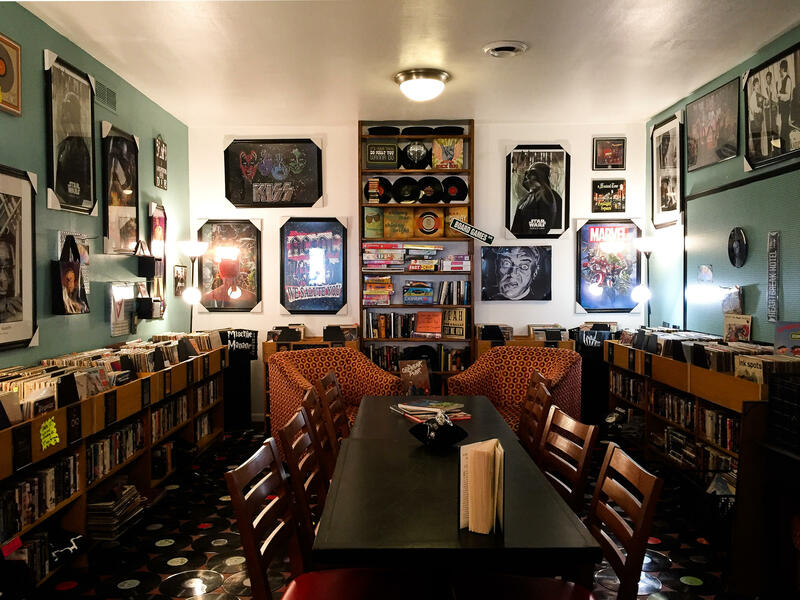 Whitaker has added a used-book store called Novel Idea Bookstore & More, which also sells used record albums, vintage posters, assorted knickknacks and includes a sweet shop with nostalgic nickel and dime candy. "It's just kind of a fun, funky place," says Whitaker. And funky it is: The record room's vinyl flooring is made up of scratched and damaged records and the store has to be one of the few places in America where you can pick up a Nancy Drew mystery, buy a vintage KISS concert poster and browse old Beatles and Coltrane records while your kids snack on Pixy Stix, Slo-Pokes, Chuckles and Bottlecaps. "I always try to do something that isn't there ... that fills another niche and that you can't find anyplace else," says Whitaker, who is 55. "I didn't want to copy anyone else in town. I wanted to try to create something else and to fill a need." Though she is tucked away in downtown Granite City, away from busy highways and thoroughfares, the town center is just a 10- to 15-minute drive from downtown St. Louis. Her customers come from across the region. "You would be surprised, the people who want old-school stuff," says Whitaker while scanning through the used VHS tapes she sells. "And I think that's what a town like my town needs," the lifelong Granite City resident says. It needs "a different experience" to stand out in tough and competitive economic times. The eclectic mix of businesses appears to be successful. Whitaker says she has 35 employees, and her businesses have grown even during the last two years while the U.S. Steel mill has been largely shut down. "My personal business is not affected because I wouldn't say I have a huge amount of steelworkers that come here," she says. There has been other business and cultural growth in the community, too, with an independent coffee and sandwich shop by day that becomes a music venue at night, a new movie theater, a new arts center in development and a nonprofit theater company that performs in a renovated old church. But those efforts are not producing the kinds of jobs that pay like those at the steel mill when it's running, nor like those in the industry's supply and distribution chains. And when the blast furnaces go cold? "What I've noticed, being in business all of these years, is when you have something like the mill and it's been shuttered and it's in your community, and people hear that that's no longer a viable industrial base ... they view your entire community as downtrodden. [They think] it's a dead town," Whitaker says. Amos echoes those concerns. He insists that Granite City would survive without U.S. Steel, but he concedes that one of the problems attracting new businesses is the perception that the mammoth mill is all this city has to offer. "If people hear that it is not in business, or it's on a partial shutdown or whatever, they're just not as inclined to invest in our community," Amos says. "They're more inclined to take those dollars and go somewhere else." Amos and others in Granite City say they still have a lot of work to do to prove to investors that this town has more to offer than just steel. That includes a strong workforce and access to river, rail and highway transportation networks, among other assets, which are the very same things that initially led planners to wrap this city around a steel mill in the first place, well over a century ago. Workers in traditional steel towns across the country are rejoicing over President Trump's steep tariffs on imported steel that go into effect tomorrow. Already, U.S. Steel is calling back 500 laid-off workers to restart one of its two idled blast furnaces at a mill in Granite City, Ill. That's the city's largest employer. And despite some success diversifying, its fortunes still largely rise and fall with those of the steel industry. NPR's David Schaper reports. DAVID SCHAPER, BYLINE: You can't really tell when standing in this enormous park surrounded by stately brick homes, but a steel mill wasn't exactly built here inside the city. It was actually the other way around. JAMES AMOS: Our community here - Granite City - it was originally designed as a planned community, much like Pullman in Chicago was kind of famous for being. SCHAPER: Granite City's economic development director, James Amos. AMOS: This community continued to be built around, specifically, the steel mill. SCHAPER: For more than a century, this city across the Mississippi from St. Louis has been known as a steel town. And no one knows that better than Delmar Farless who is more than a century old. DELMAR FARLESS: I'm almost six months passed. My birthday was in September. SCHAPER: Farless has lived here since 1924. He's eating lunch with some younger friends, who are in their 60s, at a local cafe. Like many in this town of 29,000, he worked in the town's signature mill for a time. It was then called Granite City Steel. FARLESS: If it weren't for Granite City Steel, people wouldn't have came here. That was the main place, boy, when I was a kid. SCHAPER: At its peak in the 1970s, the mill employed more than 4,500 people. There were still about 2,000 working there in December of 2015 when U.S. Steel laid off all but a few hundred workers. The ripple effect hit this community hard, hurting suppliers and machine shops that work with the mill as well as those running the trucks, trains and barges that haul materials to and from the mill. James Amos says there are more than 40 businesses here that are part of what is called the heavy metals industrial cluster. AMOS: And so all of these businesses are integrated together. They work together in kind of a symbiotic way, but U.S. Steel's production facility is by far the largest of them. AMOS: Granite City does not live and die on one steel mill. We're a bigger town than that, and there are other thriving jobs within our community. SCHAPER: Larry Petri certainly feels it when there are layoffs at the mill. He runs Petri Cafe which his parents opened 71 years ago just down the street from the gigantic steel mill. And the ebb and flow there has always affected the cafe's fortunes, but Petri has weathered many steel industry downturns over the years because he says U.S. Steel isn't the only game in town. LARRY PETRI: Well, we have another mill, American Steel, down there. We have the hospital. We have other smaller business that seen the effect of being shut down - the mill shut down, but they survived. SCHAPER: Among those survivors is Laura Smith who, with her husband, owns Holt's Shoe Shop which specializes in industrial work boots. SMITH: It has a steel toe and this plate that goes on top of it. So if they drop something on it, it doesn't break their foot. SCHAPER: These metatarsal boots are required for anyone working inside the steel mill, and it's a big part of the Smith's business. SMITH: When they shut down, we went down about 28 percent. SCHAPER: So Holt's shoes has survived by catering to customers who work in other less prominent industries, like the area's rail yards, a major port on the Mississippi, food and beverage processing plants, healthcare and other factories. Economic development director, James Amos, insists that Granite City would survive without U.S. Steel, but he concedes that one of the problems attracting new businesses is the perception that the mammoth mill is all the city has to offer. AMOS: If people hear that it is not in business, or it's on a partial shutdown or whatever, they're just not as inclined to invest in our community. They're more inclined to take those dollars and go somewhere else. SCHAPER: Amos and others here in Granite City say the town still needs to prove to investors that this town has more to offer than just steel. That includes a strong workforce and access to river, rail and highway transportation networks - the same things that initially led planners to wrap this city around a steel mill in the first place well over a century ago. David Schaper, NPR News, Granite City, Ill.
(SOUNDBITE OF BLUE LAB BEATS SONG, "PINEAPPLE") Transcript provided by NPR, Copyright NPR.